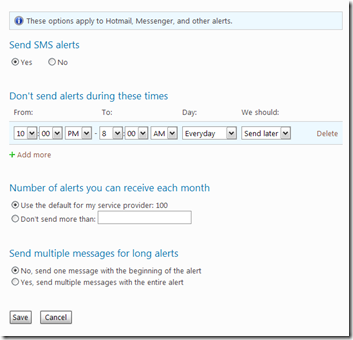 Several months ago I had opted to receive SMS Live alerts for a variety of services that included headlines, scores, stocks, and new emails. Unfortunately I was getting mail alerts at all hours of the night and this was frustrating me, and more importantly my better half. So a quick look at the Mobile options on Live showed that I can select blackout times where I do not want to receive SMS alerts. 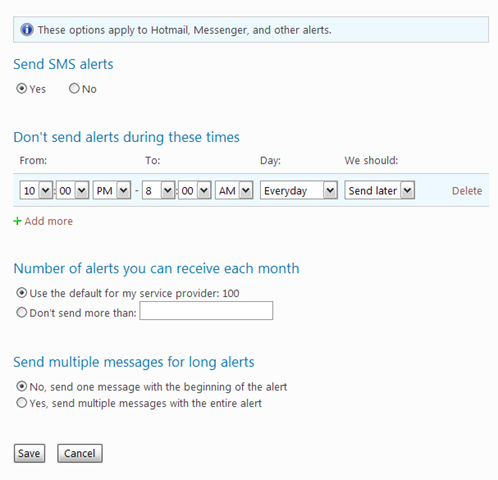 Additionally you have the option to send alerts after the blackout period or simply discard them. If your cell phone service has a cap on text messaging, you can reflect that in the number of alerts you receive from Live in a given month. I am really jazzed about it … here is to a good nights sleep.